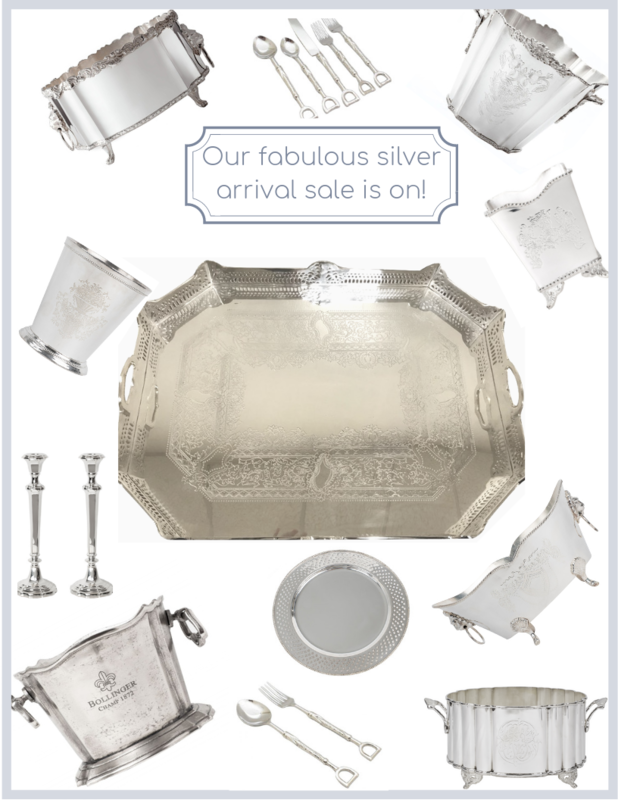 Hello, calling all silver lovers!! 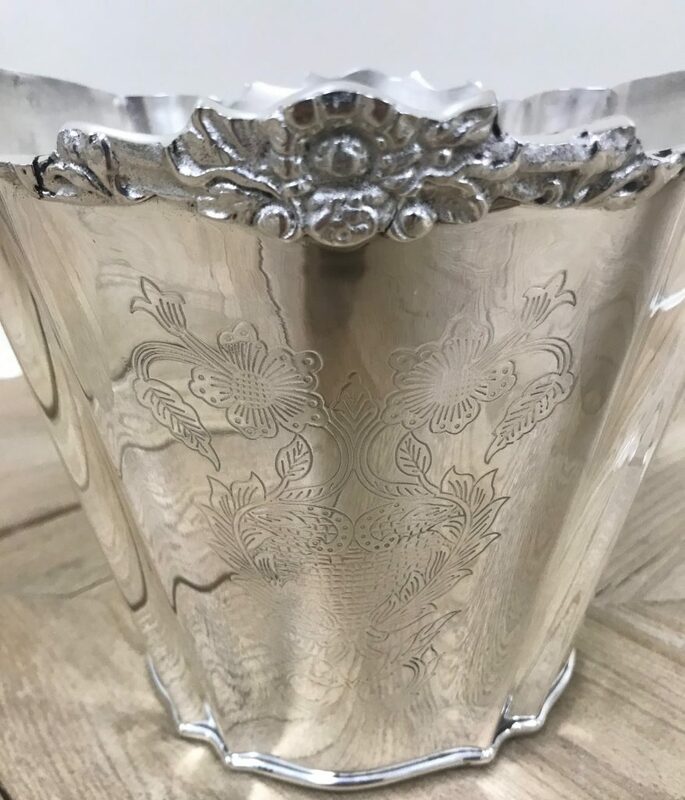 We just got in a fabulous shipment of silver that has put me in the mood to do some entertaining:) Few things can add such a beautiful touch of elegance like the gleam of gorgeous silver and this offering is pretty spectacular. 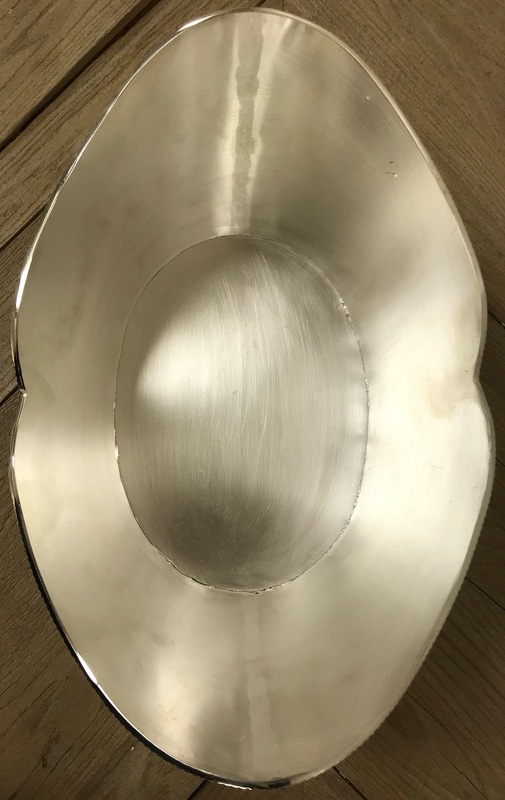 I have always been a fan, grew up with a mom who used lots of silver but as an adult when I went to find it, realized there were fewer and fewer places that carried high quality but affordable silver, which is how this line was introduced and has grown considerably. 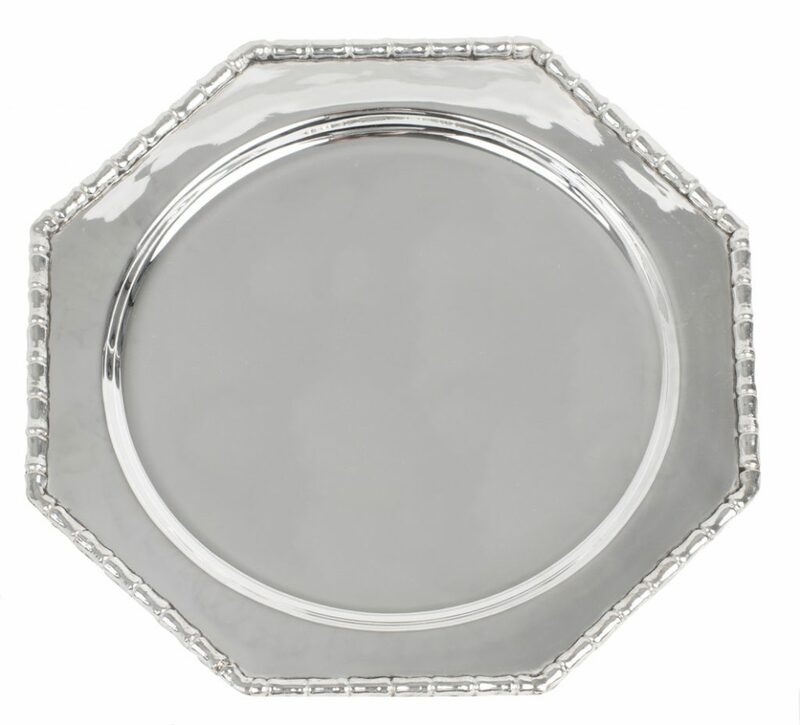 Among many other great new arrivals, we are expanding our beautiful silver collection. These are all high quality silverplate (with a brass core). Exceptional attention to detail and just a beautiful quality. These are all in stock and ready to ship now! Every purchase over $500 will get an additional 10% off these already amazing prices! ITEM 1 Look who’s back! 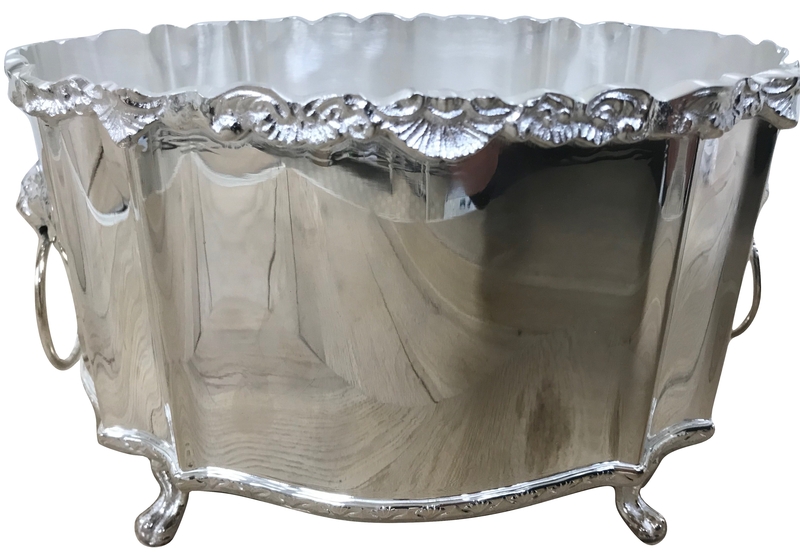 Possibly our all time best selling mid sized wine cooler/planter. How beautiful is this! 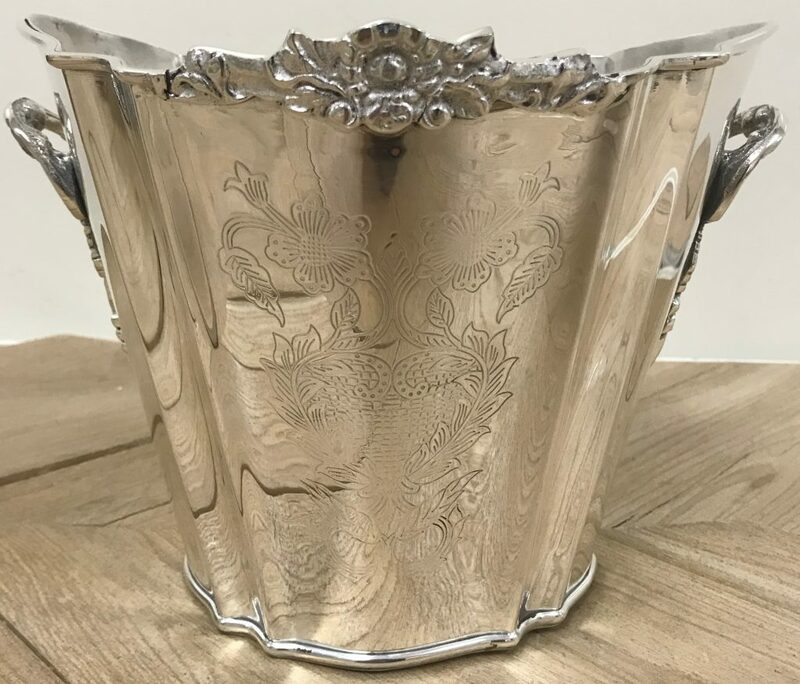 The fabulous etch work, engraved detailing and stunning beveled oval make this one spectacular piece Has two handles and this is used equally well as a beverage holder or as a planter. ITEM 2 Another best seller has come home. This beautiful and very elegant planter is so pretty for so many things. Planted with orchids it is a masterpiece, I use mine every holiday to hold wrapped up cutlery when we are doing a big buffet, makes such an elegant “holder”. Some use it for the mail. Features a beautiful engraved design, two rings on either side and 4 elegant feet. ITEM 3 This is the stuff large gallery tray dreams are made of, such a spectacular tray and most definitely one of my all time favorites. Did a little happy dance seeing this come in:) The details on this beauty are incredible. First the size- this is GRAND! Then the pierced rim is so beautifully detailed and then you have the most gorgeous engrave work on the face. 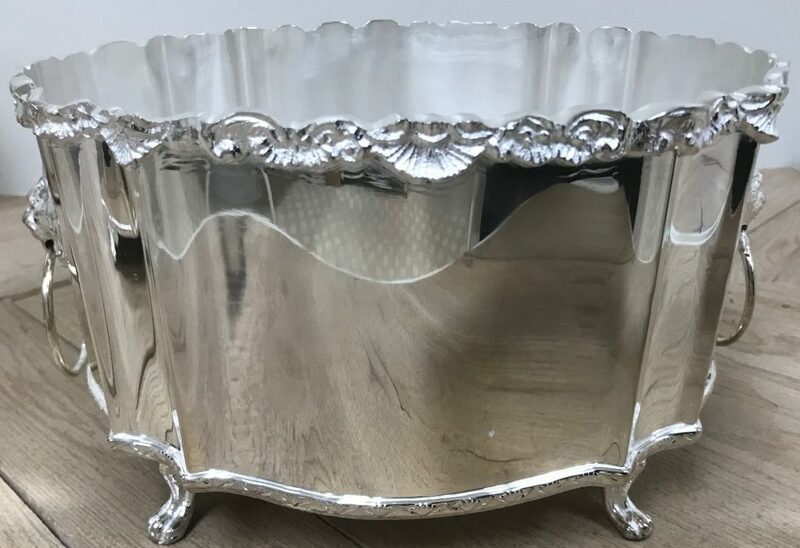 This is a beauty to serve with and equally fabulous on a cocktail table or on a bar. Features two handles in case you want to serve a round of drinks at your next party:) Trays like this are often seen for several hundreds of dollars so you will recognize the incredible value of my being a direct importer here. 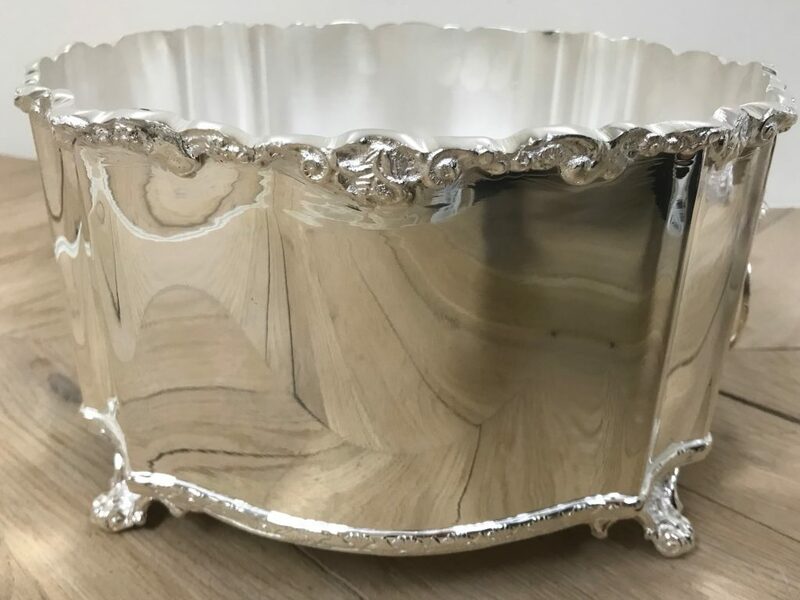 ITEM 4 This is a new round silver planter and what a beauty! How pretty is the shell/floral relief pattern alongside the rim, features four elegant feet and two lion head rings. 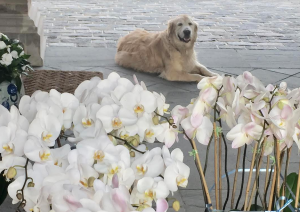 Perfect for orchids, flowering plants or even with nothing at all! 4B The same planter but in an elegant oval shape. This one could also be used to hold wine bottles, your favorite flowering plants or orchids and even as a pretty way to display utensils at a buffet, etc….elegance personified! 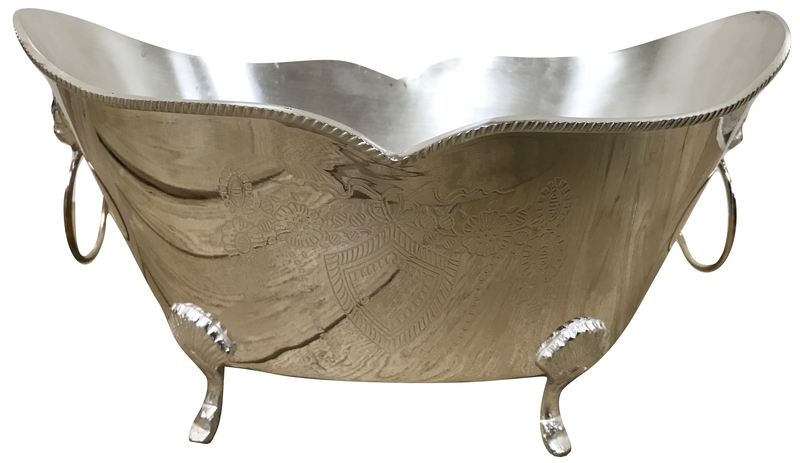 ITEM 5 Love our new antiqued nickel French large beverage tub. 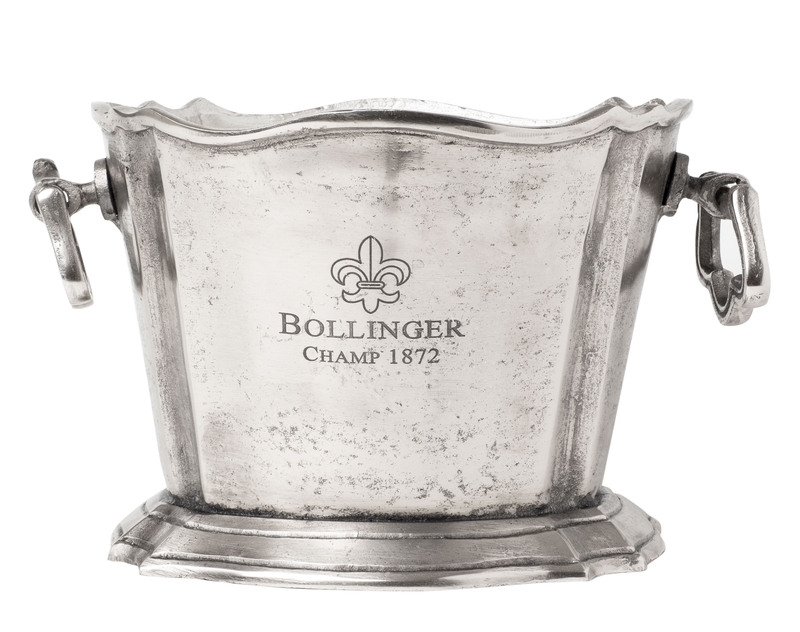 This is a beauty, has been “antiqued” and can comfortably hold four of your favorite bottles. Also would make a gorgeous planter for orchids. 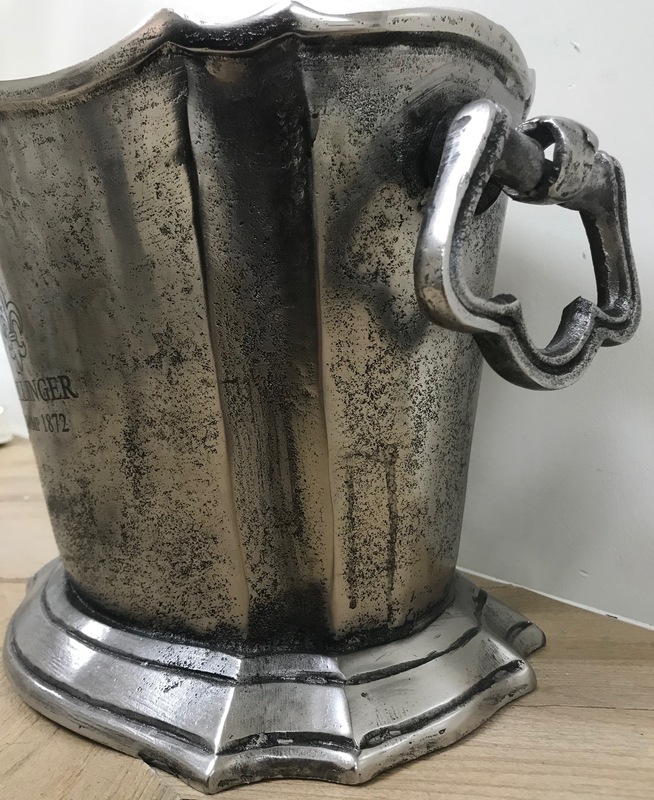 Love the French engraving and pretty heavy handles on either side. 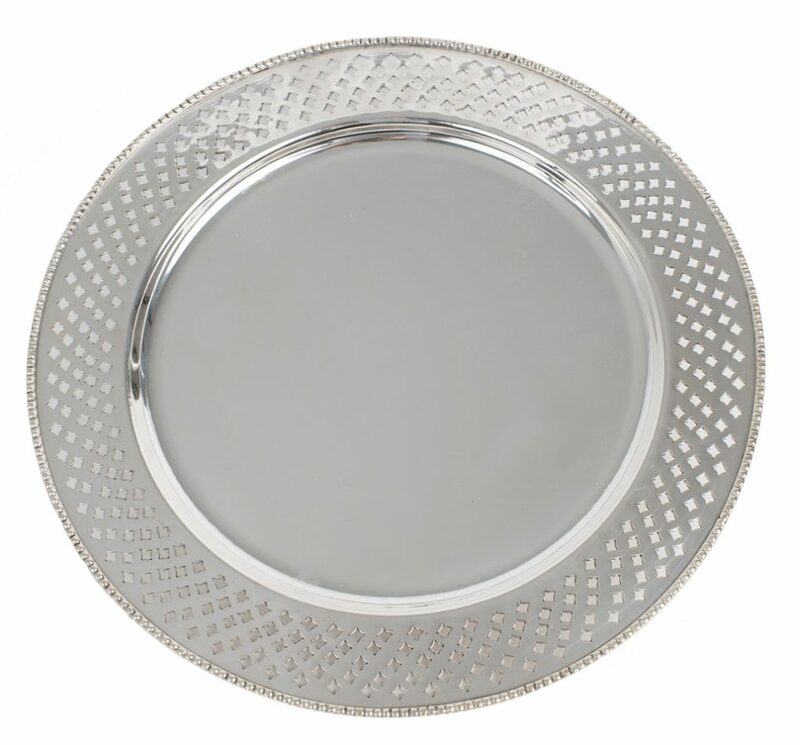 ITEM 6 Freshly stocked on my gorgeous silver and most elegant chargers. 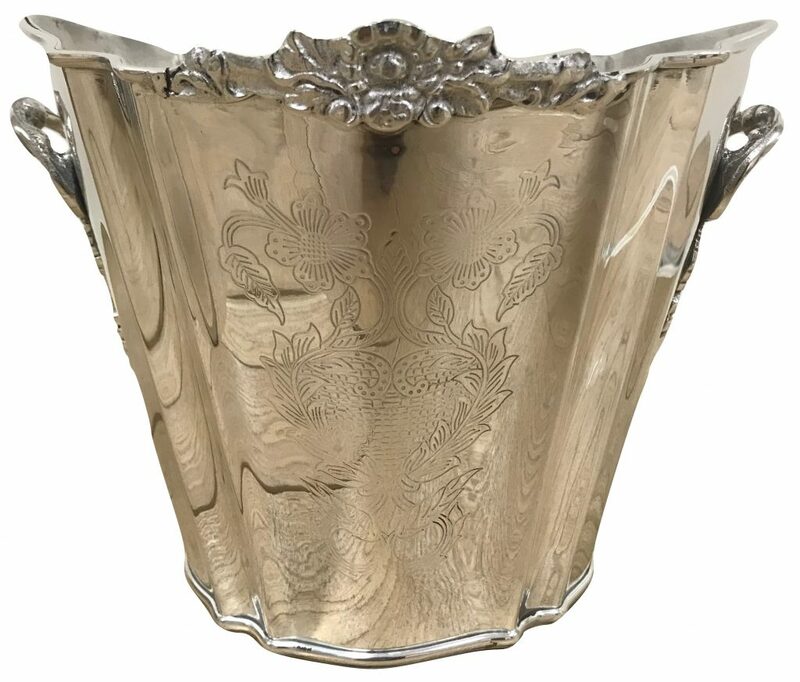 These are the height of elegance and will beautifully dress up any china pattern. Just a fabulous way to escalate any tablescape….classic elegance at it’s prettiest! 14″ round. 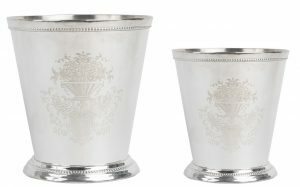 ITEM 7 Etched mint julep, offered in two sizes. These are incredible and besides using them as mint juleps they make the best bud vases. 9B Five piece place setting of this gorgeous equestrian themed place setting, sold as a set of 5. $25.00 per place setting. 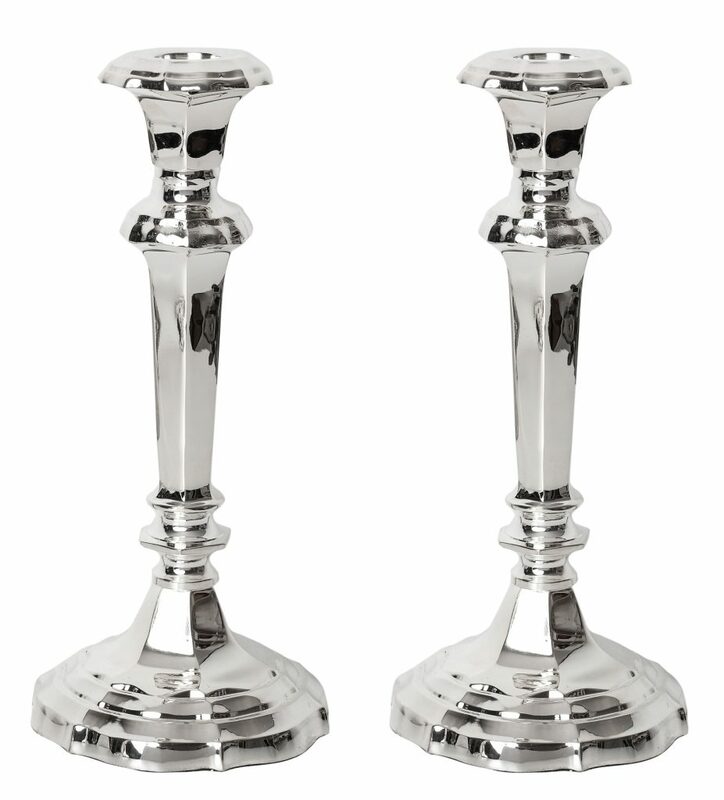 ITEM 10 Nothing like an elegant pair of beautiful silver candlesticks to grace a dining table (or a console/sideboard). 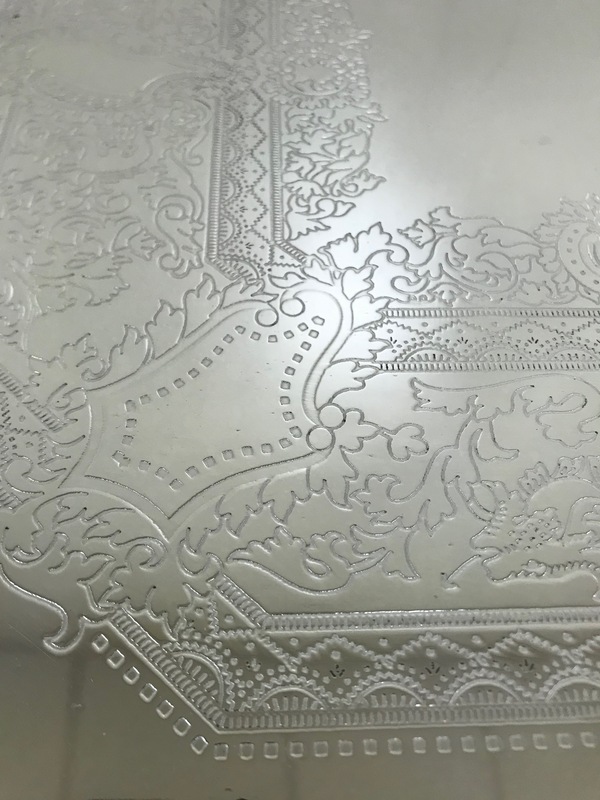 These scalloped beauties are not only intricately detailed but very heavy. Offered in two sizes- med and large. These are truly an exceptional deal! Med 9″ $55.00 for the pair! 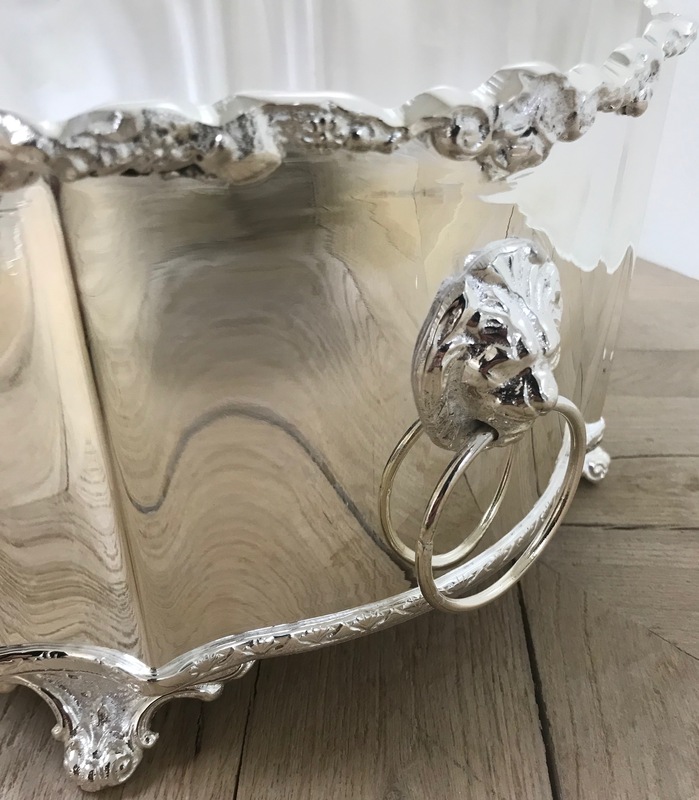 One super lucky silver loving reader will win two of our silver items! 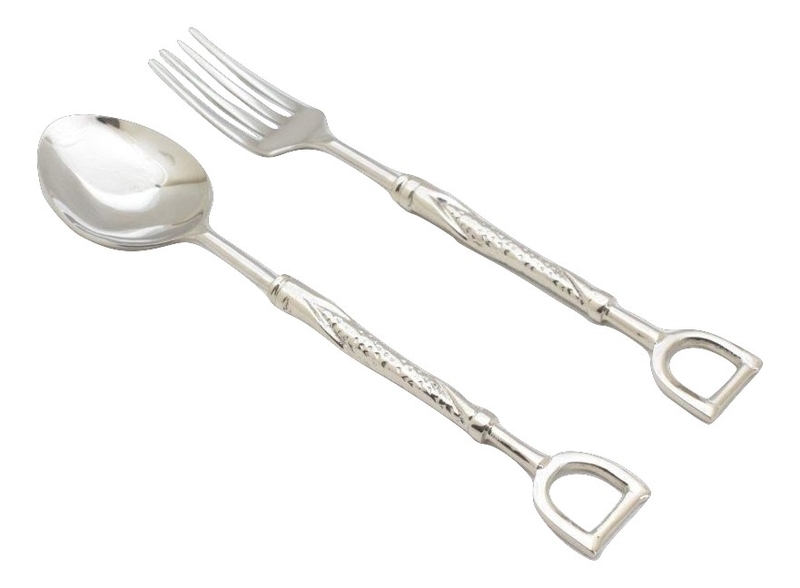 Winner will receive one medium mint julep and a pair of our fabulous silver salad servers! Just leave a comment on this post to throw your name in the hat and I will announce a winner on Sunday, so do check back! Great give away. Thanks Tina. 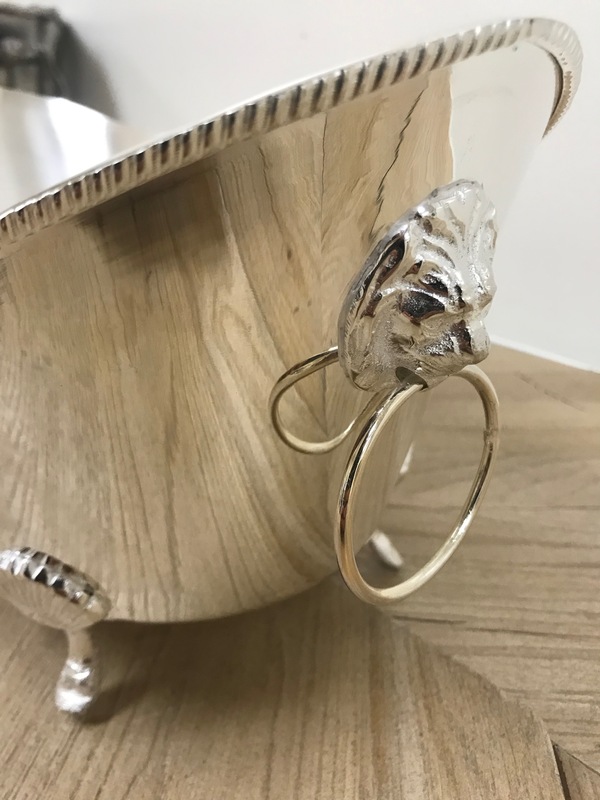 Beautiful and affordable silver pieces! Perfect timing for the equestrian items… Happy Spring! It’s all beautiful! Love the bamboo charger! Fabulous! I especially love the horse julep cups! Lovely, lovely, as usual! All chic pieces. Every item a beauty. I love the large beverage tub. Thank you for the chance to win the giveaway. I’m one of those crazy people who actually enjoys polishing my silver! Love all the silver pieces ! You are amazing! I was almost too scared to open this email when I saw that it was about your silver arrival. Of course, I did. Gorgeous silver pieces everyone of them! Love the French Bolinger wine 🍷 holder… fun for a wine and cheese party!!! All the pieces are beautiful. 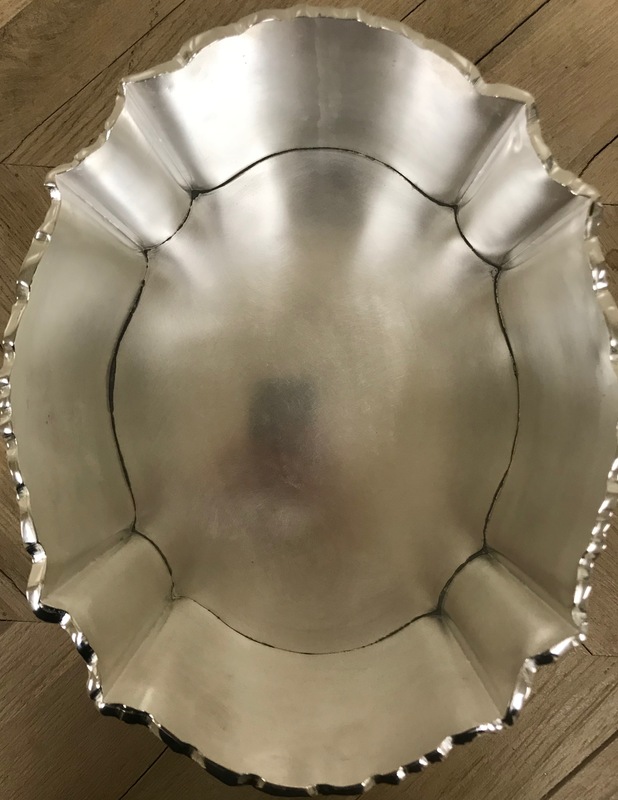 Would you consider offering a Silver teapot? I would love to have a teapot and silver sugar & creamer set, so elegant. Thank you! All the silver is gorgeous. Love the chargers. 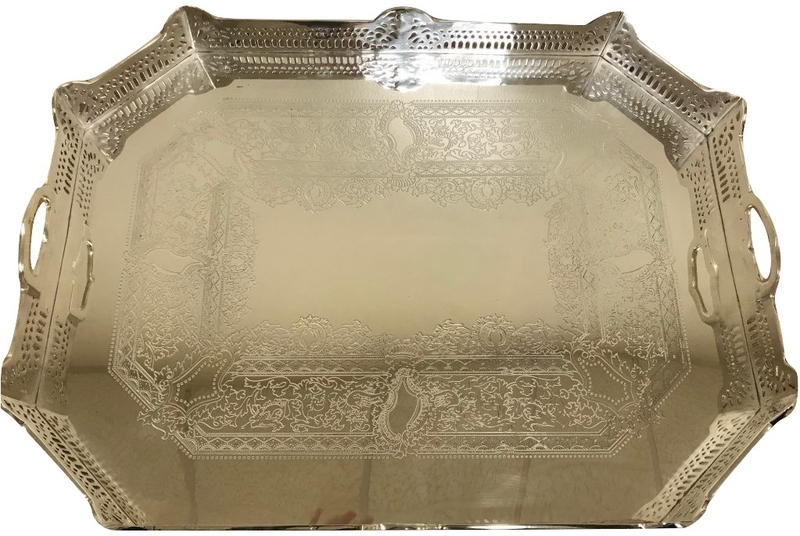 Once again you have filled a hole with great silver items! Absolutely love item #1. I can just see my large orchid in this. Thanks for always uplifting my day. 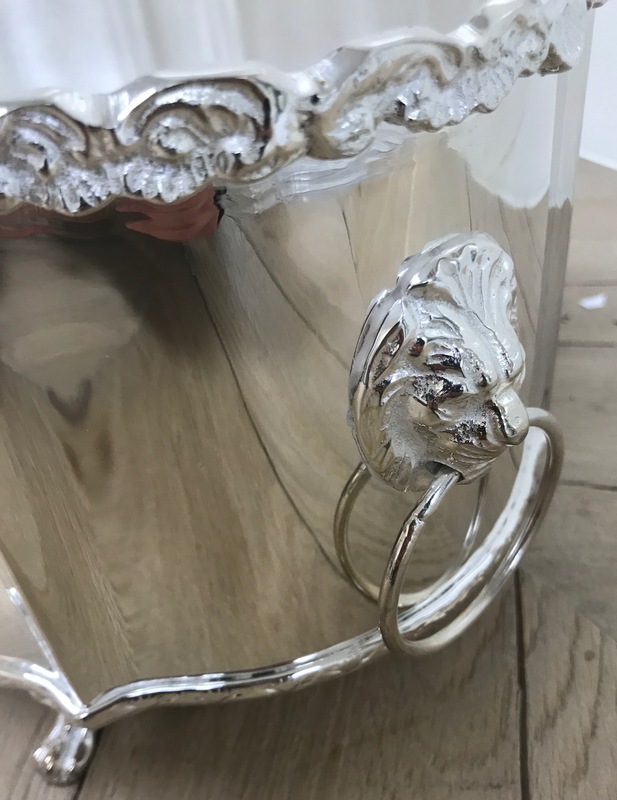 Beautiful silver items, simply gorgeous! Love the equestrian items! All of the silver is beautiful! Silver is classic for us hospitalitarians! Nothing says “I’m serious about entertaining” like polished silver and an ironed table cloth and napkins. Great looking silver pieces. Liked the idea of using the planter for utensils when entertaining. Love the mint juleps! Great bud vases. Beautiful silver all of it. Silver is fabulous!! My husband has a professional buffer, when I can get him to polish for me! 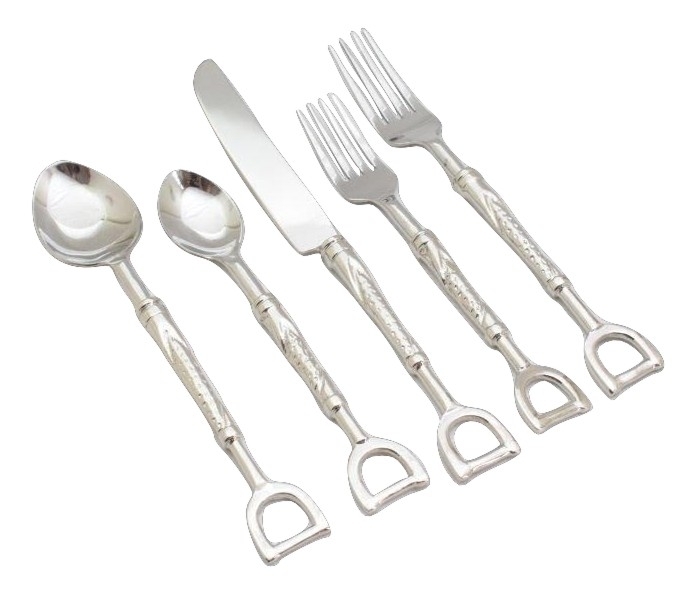 Wouldn’t the Equestrian silverware be nice for all of those ladies who belong to Garden Clubs?! 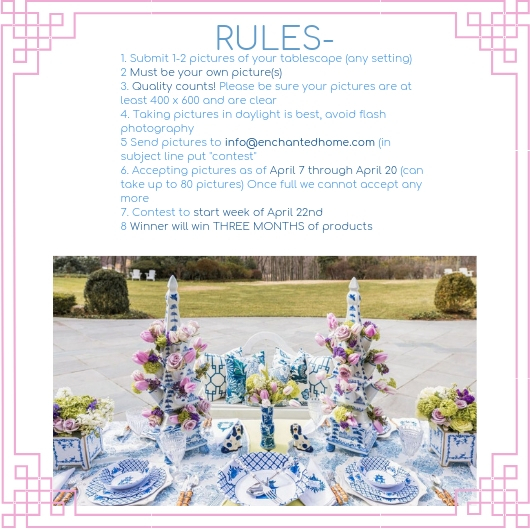 Offering a place setting as a door prize & etc. 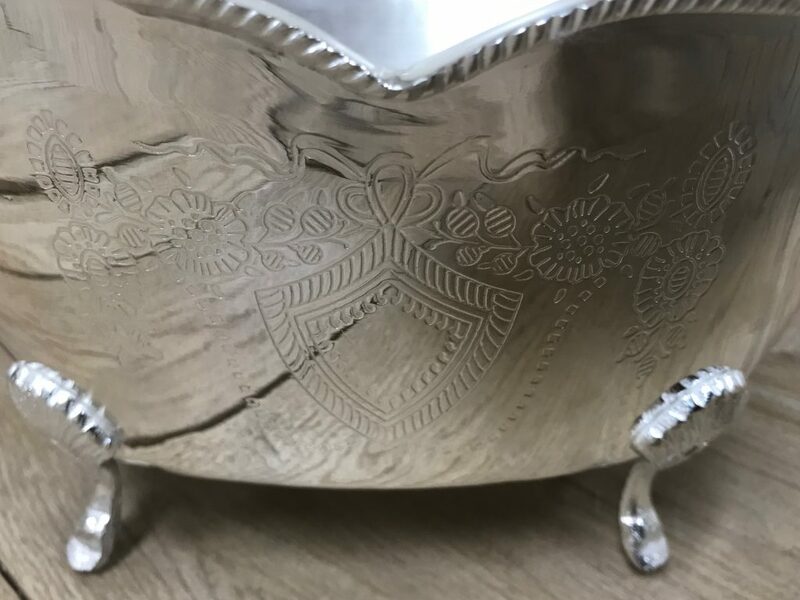 From one silver lover to another – thanks for the beautiful selection! These pieces are SO versatile! Love it all! Each piece is timeless! You are so right! These are gorgeous pieces. Love the equestrian items. 🌸 The SILVER pieces you are offering is beautiful. 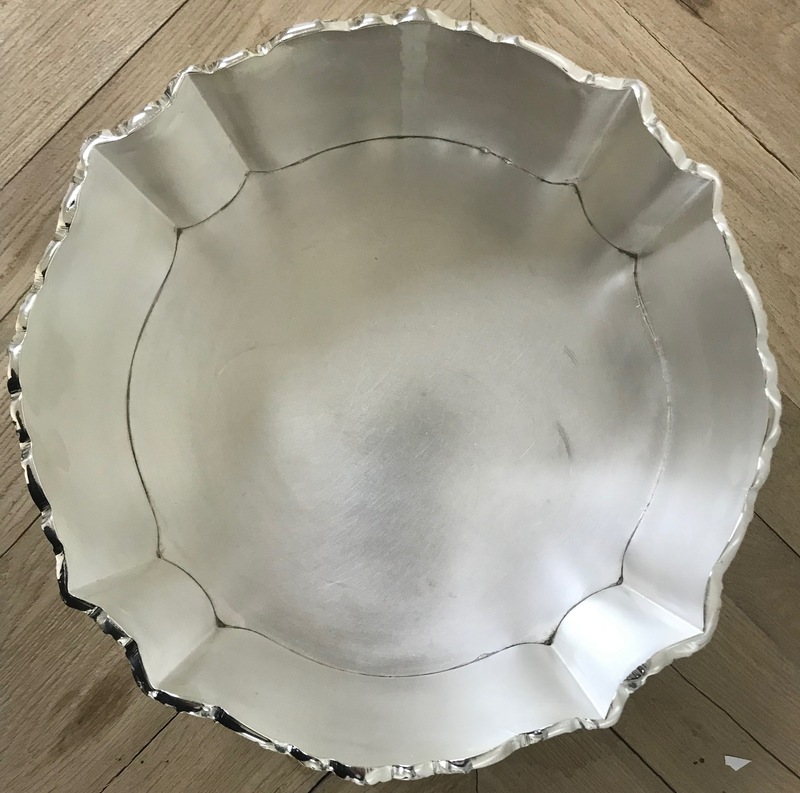 Love silver pieces in the home. It always takes your home decor to the next level. Classy! The salad pieces are my favorite! So many stunning pieces it’s difficult to choose what to add to my TEH candlesticks that bring me so much joy. The mint julep cups are amazing…..and oh, so Southern! <3 Pass the whiskey, 'dah-lin'! 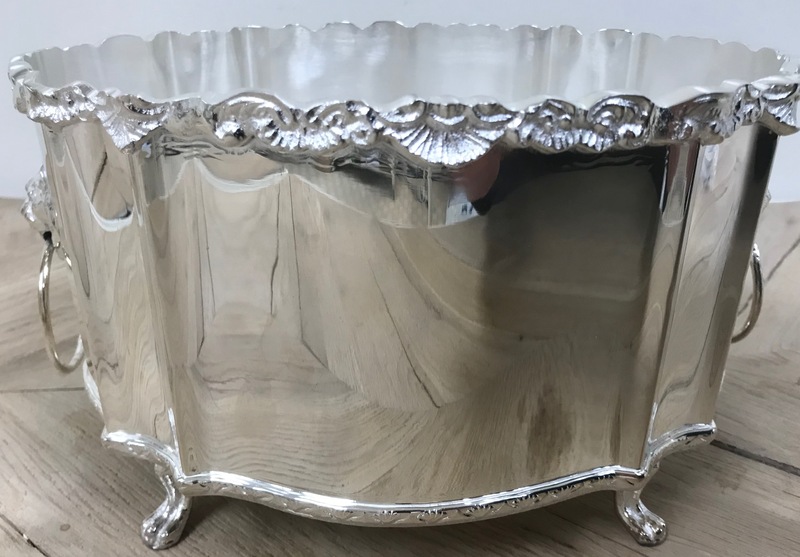 I love polishing silver! I know, crazy! Love love love ❤️ silver. Do not understand why young people do not want it anymore. It is beautiful and classic. I would use any of those pieces. 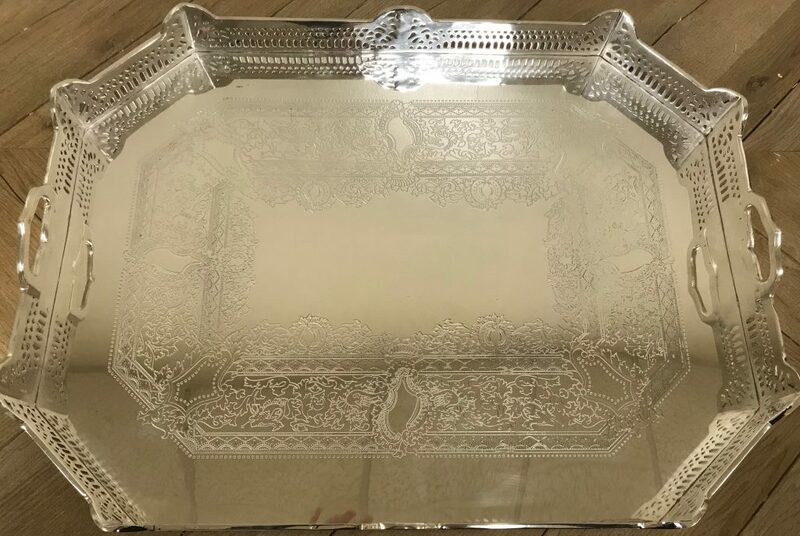 Love the pierced tray! I think this would look nice on my vanity. Everything is so pretty! Love the antiqued French bottle holder. Love, love silver pieces. The candle sticks would be lovely as gifts. I love the silver candlesticks with beaded shades that I purchased from you!! I too love to polish silver!! Beautiful selection!! 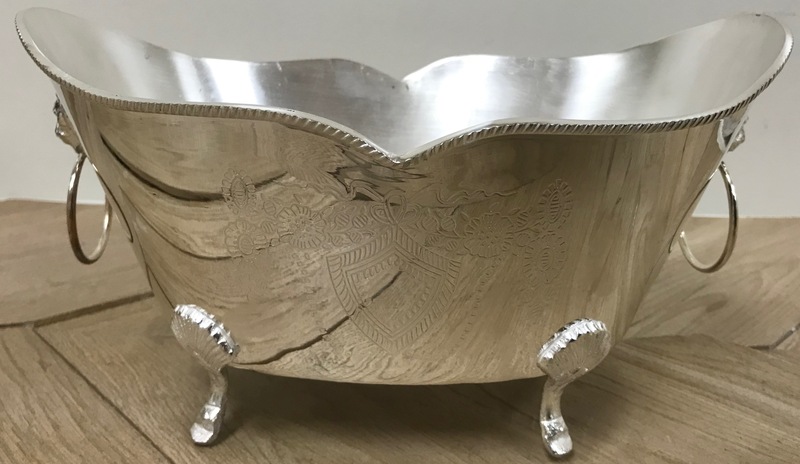 My husband collects Georgian silver so we are really all set!!! 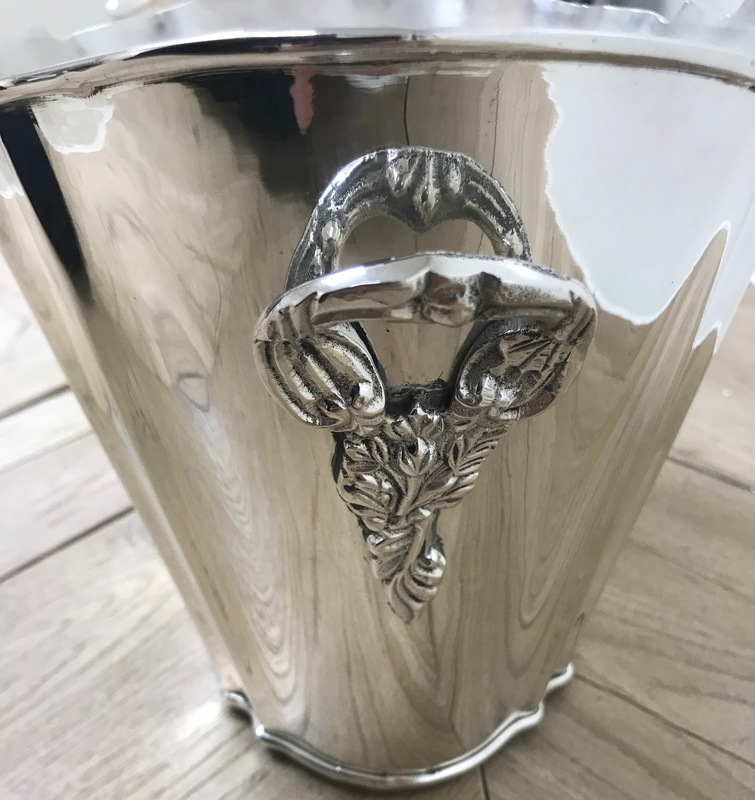 Love all the silver pieces, especially Item 4B, silver planter with lion head handles. It would look great with an orchid or two in it. Everything is beautiful! As always… love, love, love the equestrian themed items! Love all of the silver! Oh my…I love the Kentucky Derby! I have a huge set of mint julep cups, monogrammed and use them every year. I’m more than happy to add to that collection, and enjoy the salad servers too! Thanks for the giveaway! Your taste is impeccable! I love all the pieces. Lovely new things – wonderful for planters! What a yummy selection of silver! Gosh i love silver – especially with flowers! Thanks for offering such great pieces AND a giveaway. I love silver. Always an elegant touch to a table setting or a vase on a table! Think I need candlesticks….like these a lot! Could you look for ice tongs? Thanks. Love it all! The etched mint juleps have so many uses! Love the large French beverage tub! What a beautiful array of silver you have!! I especially love the pierced round chargers with beaded edge and both sizes of your candlesticks. They are such a good price point. There’s just nothing more classic or beautiful than silver! Your collection is fabulous!!! 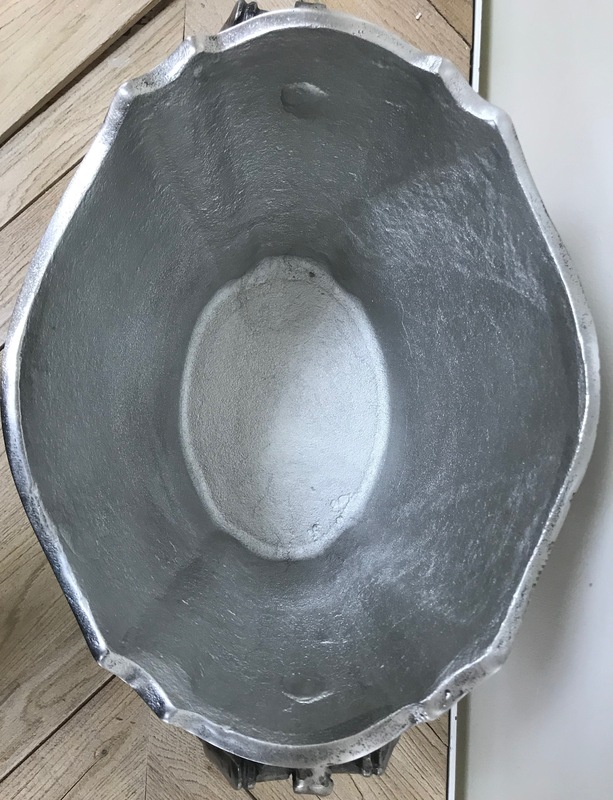 I am also a silver lover and try to use mine often. Life is too short not to enjoy the pretty! Beautiful! I really love the new oval planter and the candlesticks. Thank you for your beautiful posts. I really enjoy your feed. Love the mint juleps and wine cooler especially! Thanks so much! Lovely pieces. Nothing is more elegant than silver. 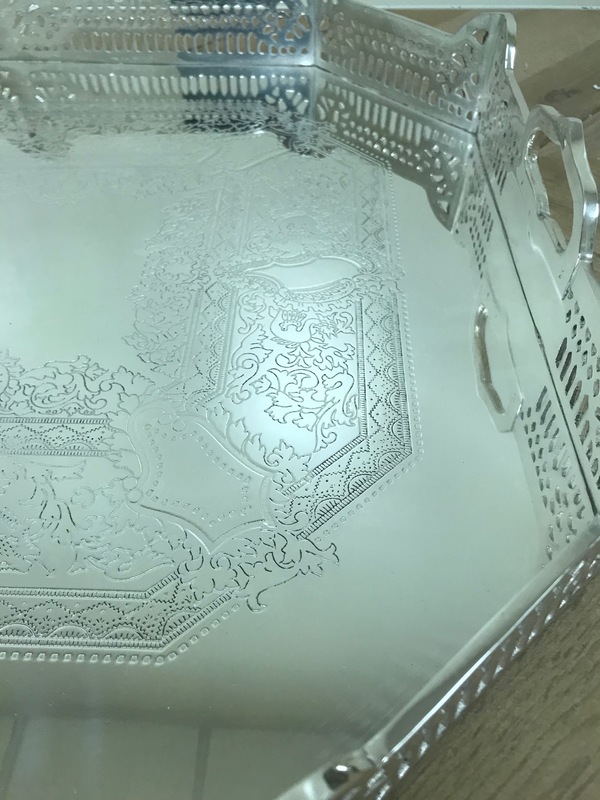 Fabulous silver! Love the large tray. 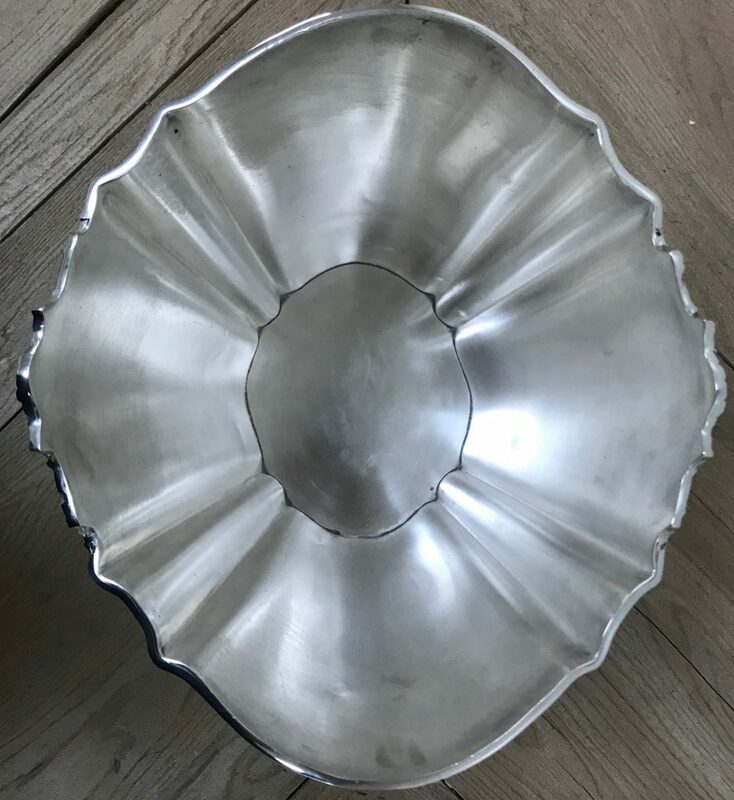 Hope to add to my vintage silver collection very soon. So much to love here. My favorites: the lion handled planters. 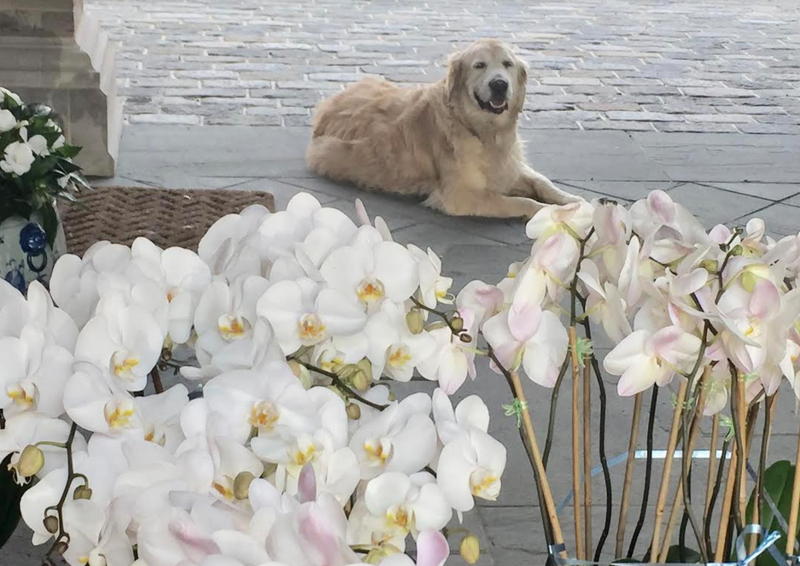 So love seeing your updates on your PB home! Also, love all these silver plant holders. Beautiful pieces! Love the round pierced chargers. Everything is gorgeous as usual! Love these new silver item!!! Just love the candle lamps with the bamboo motif that I recently purchased. And your mint julep cup is on my desk right now holding a pair of hibiscus blooms. Love your beautiful things. Love the beautiful tray & mint julep cups !!!!! Everything is so beautiful, it is so hard to choose. I love it all! Your love for silver always inspired me to use the once’s I have. Thank you! Your new collection is one of a kind , would love to have them on my table. Love, love, love the mint julep cups!!! Everything is absolutely gorgeous! I think I need the candlesticks though!! Thanks for the beautiful offerings! Oh boy that is a wonderful givewaway! Love the lines on #2……just wonderful. The silver pieces are gorgeous. Adding to my wish list. 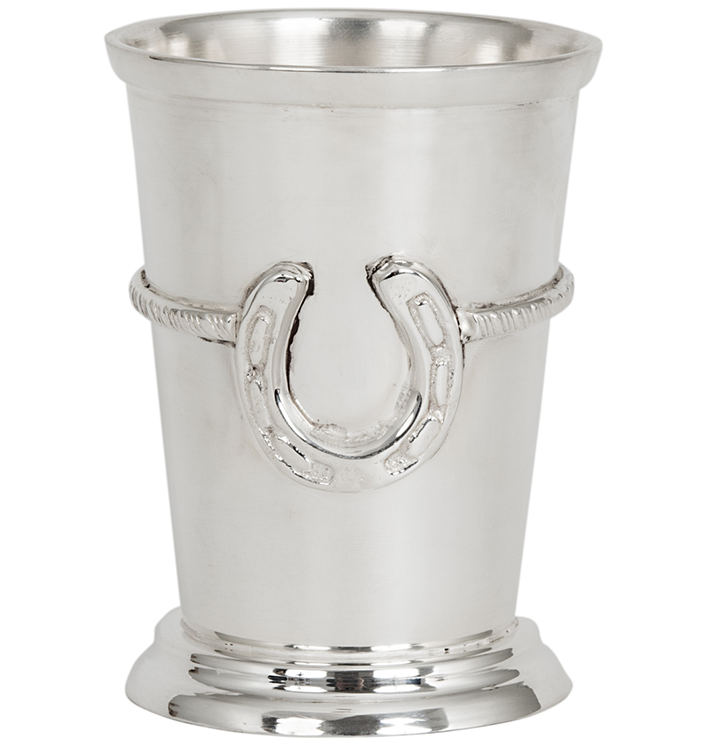 I love the equestrian mint julep cup. It is so pretty. There is nothing like silver to bring elegance! LOVE all the prices, it would be hard to pick a favorite! Love that elegant gallery tray! Love the mint julep cups. They are so versatile! Love your beautiful, shiny and timeless silver. 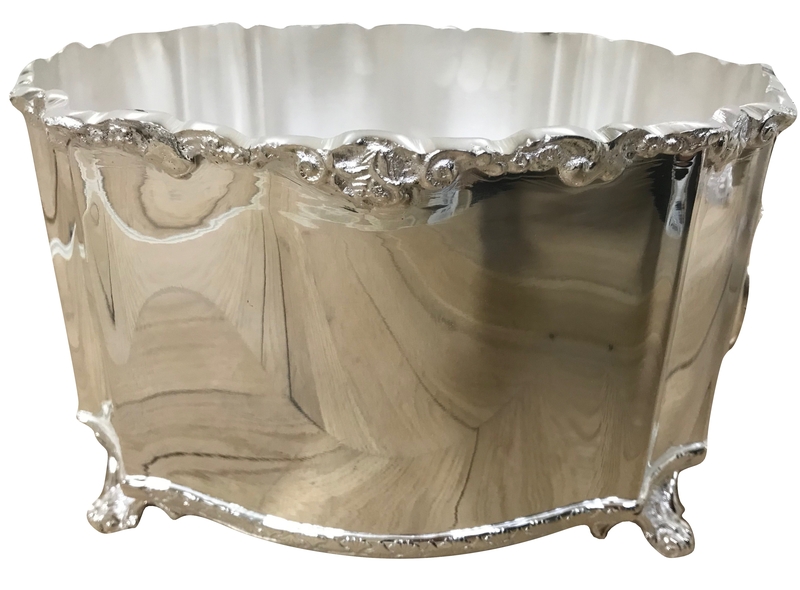 I absolutely love my silver beverage tub!!! I love the large beverage tub. Perfect for holding champagne bottles! Being Southern, I of course love both styles of your mint julep cups. My favorite of your items shown today is the silver candlesticks. 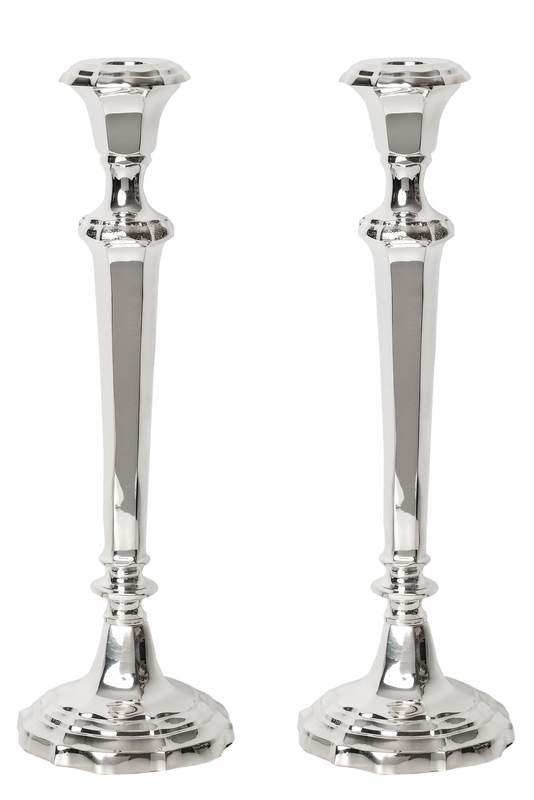 The simple classic styling of the silver candlesticks will make them stand out in any setting. Mint juleps for my spring flowers! 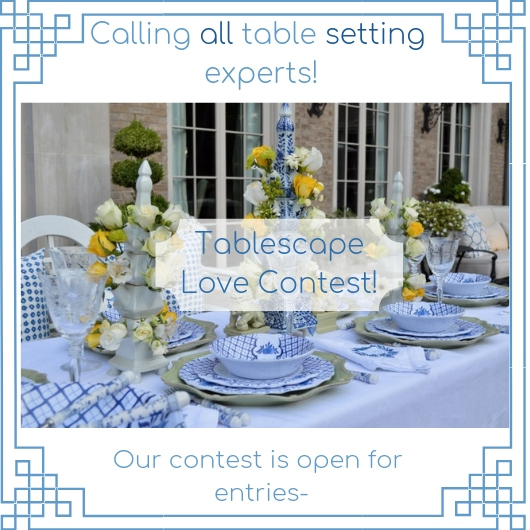 I’d love to win! 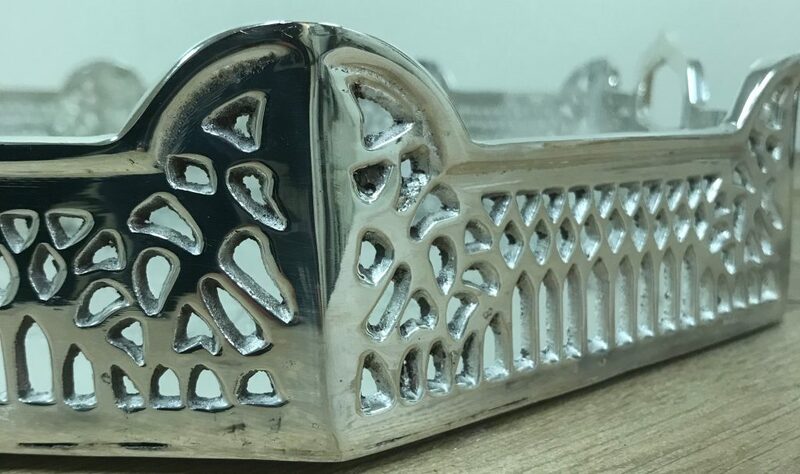 Beautiful silver pieces….. I especially love the large gallery tray! Thanks. Hi! I just love the wine/cooler planter that was listed first! It is so beautiful with so many uses! Love ,love , love the silver . They are not only gorgeous but they multifunctional . Love your silver! I’m lucky to have added some mint juleps and a planter or two. Thanks for making these additions to your shop as they are lovely and affordable! I love the silver salad servers! So beautiful! Love the silver pieces. My passion is for the candlesticks! The chargers are really nice.